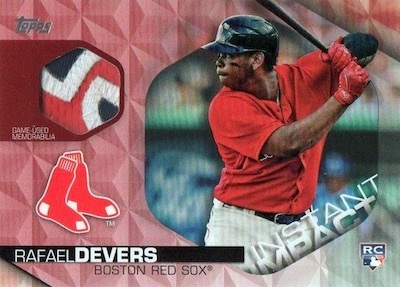 Wedged in the middle of the annual flagship MLB trilogy, 2018 Topps Series 2 Baseball adds more rookies and stars to the base set, continues several insert lines, and provides a few new elements. Building on the Series 1 set, 2018 Topps Series 2 collectors can pick between the standard Hobby box with one autograph or relic, or the Jumbo box that promises one autograph and two relics. In addition, 2018 Topps Series 2 Baseball is part of the Silver Packs promo featuring chromium versions of the 1983 design. Each Hobby box purchase earns one pack, while Jumbo results in two. The promotional set includes limited parallels and autographs, as well. While the 2018 Topps Series 2 Baseball checklist rolls in 350 new cards, including key veteran subjects and first-year players, the parallels keep to the status quo. Base variations include SP and SSP images, plus two late rookie additions to the base set. 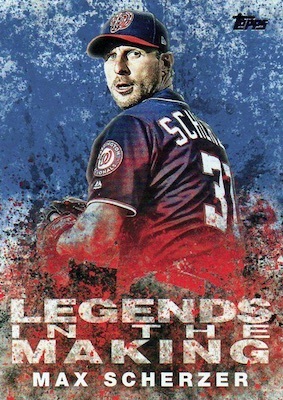 Dropping several per box, 2018 Topps Series 2 extends S1 insert lines like the 100-card Topps Salute. Averaging 1:4 packs, these offer themed subsets such as Fieldwork, Legends, Notable At-Bats, Rookies, Throwback Jerseys, and Walk-Offs. Looking back, Instant Impacts pinpoints the emergence of 50 superstars from their early days in the league. 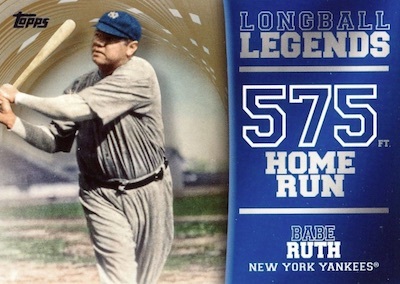 Meanwhile, paying tribute to the all-time bombs, Longball Legends (1:8 packs) highlights 50 of the best home runs ever hit. Again going back to '83, the 1983 Topps Baseball (1:4 packs) celebration moves to current rookies and All-Stars. Each insert can also be found in Blue, Black (#/299), Gold (#/50), Red (#/10) and Platinum (1/1) versions. Mainly using the insert lines from the 2018 Topps Series 2 Baseball checklist, signed cards include 1983 Topps Baseball Autographs and Topps Salute Autographs (#/99 or less). As far as parallels, 1983 has Black (#/99 or less), Gold (#/50 or less), Red (#/25 or less - Hobby) and Platinum (1/1 - Hobby/Jumbo), while Salute features Red (#/25 or less) and Platinum (1/1). There are also signed swatch cards via Instant Impact Autograph Relics, Longball Legends Autograph Relics, Major League Material Autographs, and the high-end Topps Reverence Autograph Patches. Even more limited are the Red (#/25 or less) and Platinum (1/1) editions for each set. 2018 Topps Series 2 Baseball memorabilia cards are also in good supply with several choices. The Instant Impact Relic and Longball Legends Relic sets both add Red (#/25 or less) and Platinum (1/1) options, while Major League Material comes with Black (#/99 or less), Gold (#/50 or less), Red (#/25 or less) and Platinum (1/1 - Hobby/Jumbo) parallels. Exclusive to Hobby and Jumbo formats, the one-of-one Own The Name relics contain a full nameplate letter from a player's jersey. There are also original Sketch (1/1) card drawings. 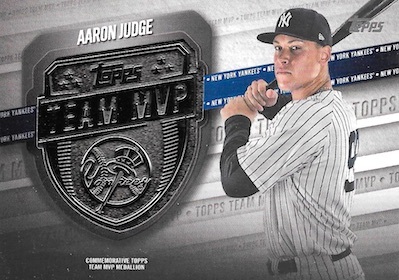 Finally, manufactured Topps Team MVP Medallions and MLB All-Star Game Logo Patch cards, which display the actual design used by specific players during their All-Star appearance, are only found in Hobby/Jumbo boxes. These have standard Gold (#/50), Red (#/10) and Platinum (1/1) parallels, as well as Autographs (#/10) for select subjects. On the non-hobby side, 2018 Topps Series 2 Baseball has retail-only Legends in the Making. This 30-card insert identifies the current players likely to enjoy a lasting legacy. Parallels include Blue (1:12 packs), Black (1:24 packs), Gold (#/50), Red (#/10) and Platinum (1/1). There are also Autograph versions for select subjects, numbered to 10 or less. 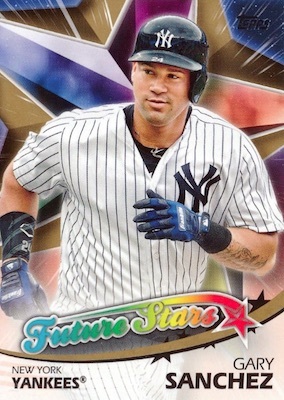 Only found in Relic Box blasters, Future Stars takes a look at 50 of the young standouts of MLB. Autographs are limited to 10 or less. 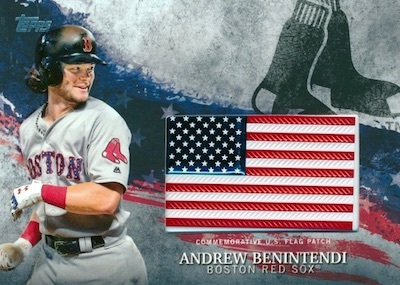 Going patriotic, the manufactured MLB Independence Day US Flag Patch set (Blaster only) combines the stars and stripes with baseball's elite. Parallels include Gold (#/99), Blue (#/50), Red (#/25), Platinum (1/1), and Autographs (#/10 or less). 2018 Topps Series 2 Jake Lamb Autograph Jersey Serial #07 25 L@@K!!! 350 cards. Shop complete base sets on eBay. PARALLEL CARDS: Purple (Meijer), Rainbow Foil (1:10 packs), Gold #/2018, Vintage Stock #/99, Independence Day #/76, Black #/67 (Hobby/Jumbo), Mother's Day Pink #/50, Father's Day Powder Blue #/50, Memorial Day Camo #/25, Negative (Hobby/Jumbo), Platinum 1/1, Printing Plates 1/1. 102 cards. Full guide and gallery. 100 cards. Hobby only. Serial numbered #/10. PARALLEL CARDS: Blue, Black #/299, Gold #/50, Red #/10, Platinum 1/1. 75 cards. Shop on eBay. PARALLEL CARDS: Black #/99 or less, Gold #/50 or less, Red #/25 or less (Hobby), Platinum 1/1 (Hobby/Jumbo). PARALLEL CARDS: Blue, Black, Gold #/50, Red #/10, Platinum 1/1. 50 cards. Serial numbered 1/1. 29 cards. Serial numbered #/10 or less. Blaster only. PARALLEL CARDS: Red #/25 or less, Platinum 1/1. PARALLEL CARDS: Blue (1:12 packs), Black (1:24 packs), Gold #/50, Red #/10, Platinum 1/1. 17 cards. Serial numbered #/10 or less. Retail only. PARALLEL CARDS: Black #/99 or less, Gold #/50 or less, Red #/25 or less, Platinum 1/1 (Hobby/Jumbo). PARALLEL CARDS: Black #/99, Gold #/50, Red #/10, Platinum 1/1. 19 cards. Serial numbered #/10 or less. Hobby/Jumbo only. PARALLEL CARDS: Gold #/99, Blue #/50, Red #/25, Platinum 1/1. 22 cards. Serial numbered #/10 or less. Blaster only. 50 cards. Serial numbered 1/1. Hobby/Jumbo only. PARALLEL CARDS: Red #/5, Platinum 1/1. 99 cards. 1:4 packs. No card #97. PARALLEL CARDS: Green (Blister), Blue, Black #/299, Gold #/50, Red #/10, Platinum 1/1. 20 cards. Serial numbered #/10. Hobby/Jumbo only. Serial numbered 1/1. Hobby/Jumbo only. View the 2018 Topps Series 2 Baseball checklist spreadsheet. Looking forward to the longball leaders and instant impacts inserts. 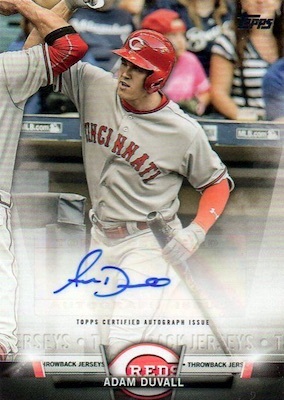 If that votto is any indication of the memorial camo cards I can say they are ridiculously ugly. I am not interested in home run leaders. Stats are on the back of each baseball card. I am interested getting more ball players on cards. I cannot field a 25 man roster. Topps has update sets after the season is over. Make rookie sets so we know who all these players are. Make them affordable for true baseball card collectors. Yeh, I have to keep on saying this because you people don’t want to do something to correct the problem. Some card company. Why in the world is it taking so long to bring series 2 and total 2018 topps baseball card sets? The season has already started and I can’t even field a 25 man roster. Series 1 came out in April and I cannot understand why the complete set of 2018 Topps baseball cards can’t come out sooner. Come on and get with it!!!! I hope that they’ll have a checklist card or base of Albert Pujols with his 600 home run. They didn’t for some reason last year in update like they did for his 500. Any info on checklist? The set releases in June so the checklist should be out about a week before then. Not sure of the cut off times but I don’t expect Torres or Acuna to have rookie cards in this set and will most likely be put into the final update set. 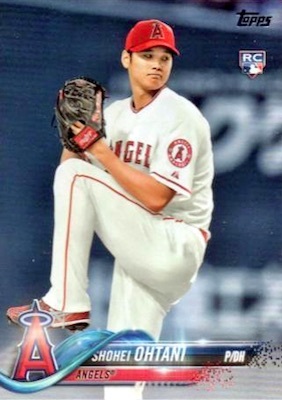 Ohtani on the other hand should have his rookie card in series 2. Little disappointment. stars 3 cards no commons cards less and less. Field 25 man roster less and less. 25 years ago other company had huge common players baseball and football now company closed. Wish you had more common players not 3 or 4 stars cards. Shortprinting Acuna and Torres is garbage. Topps has jumped the shark. WOW the A’s actually get a player, Rickey Henderson, who played for them in 1983 in the ’83 subset. Of course no autographed card of Rickey though. The ’83 Tigers were completely ignored again, NO cards of new HOFer’s Alan Trammell or Jack Morris. And finally, a card of Brandon Moss, in an A’s uniform, who isn’t even in baseball anymore after being cut two weeks into spring training! C’mon Topps get a clue as to who is actually out there playing the game! Way too many subset cards too. How about actually putting more real players playing now in the base set, eh? Agreed. Shortprinting Acuna and Torres is garbage. Not Cool Topps, you ruin a perfectly fine set by short printing the card collectors want most. Are they going to be in the Factory Set. Not Cool on the short prints. How can they include #435 Matt Holliday – New York Yankees in series 2. He has not been on the team this year. And I agree having Torres & Acuna as SP variations only is garbage. 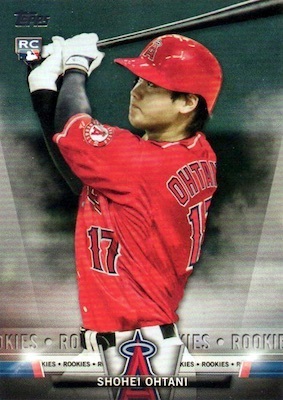 As I figured the Ohtani rookie headlines a down set when it comes to rookie cards. Series two rarely gets the top rookies as series one and the update set get the majority of them. SP rookies aren’t really considered true rookie cards so unless they can be had for a decent price I won’t be chasing them. othani out for the season tommy john surgery. watch this product drop like a rock. Well I was looking forward to the instant impacts but after looking at the checklist I am not going to collect them. They should have included story who set the rookie record for the most home runs in one month. But they included a angels player that is out for the year with tj surgery. He will be a flop. No player has really gotten back from tj surgery and been as big or lived up to the hype they had before the surgery. Tiger players dissed again! So Candelario is available in the Team Sets but not in the Series II? Very disappointing! Can get autos in blaster boxes cool, love the Judge HL & Autos. Anybody else notice that the 1983 retro all star card of Rickey Henderson, listed in the checklist as being an Athletic, is not wearing an A’s uniform. Maybe Red Sox? But definitely not a A’s uniform, which is a shame since out of the four all-star cards the A’s have, he was the only one to actually play for the A’s in ’83. Dennis Eckersley was with Boston and Canseco and McGwire weren’t even in the majors yet. The All-Star manufactured patch autos are listed here as /10. I pulled the Reggie Jackson one yesterday, and it was /5. Maybe they short printed some players? Photo quality and card stock is great, but I’m starting to not like the name plate design. I’m torn on the short printing of Acuna and Torres, it’s great there in the set and Topps wants to try and spread out rookies from an overloaded update set but at $130 for a jumbo box plus having to spend another $45 on a short print I didn’t get to complete set does stink. As usually the insert sets are too large. I light some of them but at typically a $1/card on eBay and shows is too expensive to complete. Trey – Salute Autos you say serial numbered to 99. I pulled one and it has no numbering. Does that mean there’s just 99 copies of each stock card and the parallels have the numbering? That was based on the initial info. If the base cards aren’t numbered, then the print run is unknown. Are the Acuna and Torres cards only in Jumbo packs? According to Topps, the base SP variations for Acuna/Torres are in both Hobby and Retail boxes. No Eric Davis Once again him and Rickey Henderson is the first players to steal 80 plus bases and 20 plus homers and not to mention one of the cleanest players of all time non ped’s!!! Hi Jim, the sketch cards are in Hobby and Jumbo boxes. Are you saying you pulled one from a retail box? Besides all of the hating about Acuna and Torres this is a nice release. They could have left both players completely out, they were not called up until late April, but made them “Late RC” SP’s. Probably because the product was already in production when the teams called them up. Just saw a Noah Syndergaard sketch card on eBay. Shortprinting Torres and Acuna is ridiculous. Wait for the Update set to release a true rookie card and then have the SP and SSP versions in THAT set. 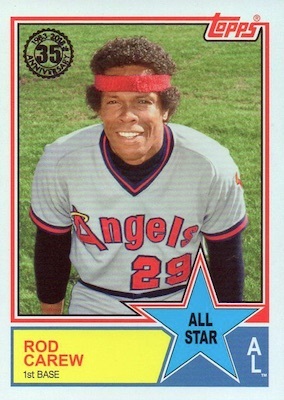 I’m also tired of Topps limiting production of the bigger names. In Series 1, I opened a Jumbo box, probably 10 hanger boxes and a couple of blaster boxes (and probably the equivalent of a retail box with pack purchases) and I only got ONE regular Aaron Judge #1 card! HOW the heck is that possible? Another thing, those manufactured “relics” are a joke. A real relic is a piece of uniform, bat, hat or something like that. Not a piece of lousy plastic. Ugh. I might buy a couple of blasters at Walmart for the Aaron Judge cards, but I think I will just wait for the whole set to be released and buy that. 4 Stars for the simple reason that this is a pretty standard Topps Series 2 product. It won’t blow anyone away but it shouldn’t disappoint, either. Plus, considering how the price has slightly dipped for Series 1 hobby boxes, the initial box price is fair. I picked up a box of each series today for a total of $125 ($60 & $65). That’s not bad for 2 boxes of current-year product. With Topps, you pretty much know what you’re paying for and what to expect. With a whole 1 auto OR relic per box, well, we’ve all been there. The lone auto or relic can be a bit of a let down. But for around $60, ya never know. Today I was on the right side of Lady Luck. I managed to pull a Red Autographed 1983 Smoltz insert #5/5. That was a first! I got a ASG-RS not numbered. Is that a platinum.? The All-Star Game Patch for Sandberg? The base versions aren’t numbered, only parallels. Am I reading this correctly? Base set, there is no number #364 or #565, yet multiple cards found for #365 and #564. Can you confirm? Two cards share #365 and two cards share #564. There is no card for #364 and 565. My Jumbo Hobby box was missing inserts in some packs which was disappointing especially considering I paid $169 presale. 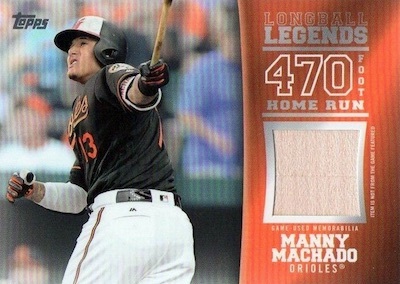 Long ball leaders is a great insert but the commemorative patch – whilst a good looking card – is not authentic memorabilia in my opinion. Much prefer the From the Farm relic cards in Pro Debut. What are the odds of pulling a SP Acuna or Torres? how many do they make when they call it short print. Topps never issued the official odds for Acuna/Torres, but info from breakers indicates about one per case. I know I’m late to the party here but wanted to chime in. Every Topps set since 1979, mostly hand sorted from wax. I get three boxes of every series. My 2018 Series 1 was so bad I considered giving it up. As far as Inserts, way better than Series 1 including: I got an auto AND relic in ONE regular hobby box, that has never happened and five variations, still no SSP but there’s hope. I must admit I was against the short prints of Acuna and Torres, until I got an Acuna. 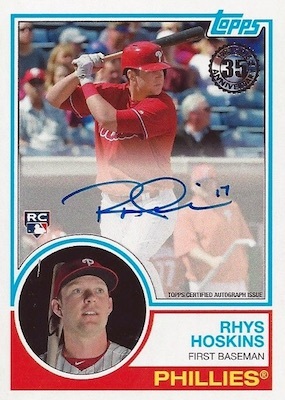 And like the guy said above Topps “could have left both players completely out, they were not called up until late April, but made them “Late RC” SP’s. Probably because the product was already in production when the teams called them up.” Sorting my commons now, compared to Series 1 better: Centering, Collation, Photography. I’m not sure where the guy above came up with Topps ‘short printing’ production of major star’s regular cards, again I’ve been collecting close to 40 years I have seen no evidence of it. 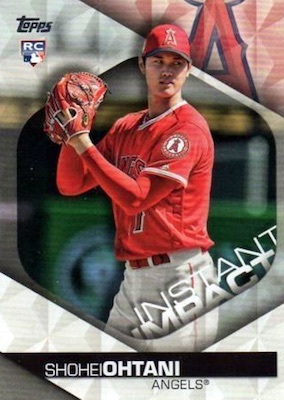 Nice changes Topps, almost makes me feel you listened to my Series 1 rants. I forgot one small complaint, is anybody but me bothered by the fact that the 1983 Topps Baseball inserts are not on traditional cardboard stock like 2017’s ‘1987 Topps Baseball’ cards? 1983, too me, is the best design of the ‘80’s, maybe one of the best of all time. It would have been nice to relive them in cardboard again instead of thin paper. Look for a different way to save money Topps, give us retro back in true retro style. Have text missing on salute insert design, # codes match, different players. Is it significant? I was wondering if you heard anything about an error card in the exclusive Aaron Judge highlights set from Walmart? I opened a blaster box and got a Judge Highlight card that was missing the chrome lettering on the front for both the Judge info and the Topps logo. Is this possibly an “error” variation? There is a green variation of the Topps Salute cards that are in 4-pack blister packs. I picked some up at Target, and got a Clint Frazier and Shohei Ohtani. I quite like this product even though it doesn’t touch Bowman. Managed to hit a one of one Joey Votto ‘in the name’ patch. I thought I was hallucinating when I first saw it. Easily my best hit of about 8 series 2 Jumbo Hobbies this year. Most of the relics have been those commemorative patches( junk) and the MVP Medallions. Also managed to get the SP Torres and Acuna but like most of these cards one of the corners is dodgy. That’s the main issue with this product – the quality of the card itself…or lack of. No way could I grade either of the SPs. They’d be lucky to get an 8 which is a shame because the Acuna Jr is already around the $80 mark. 2018 Topps Series 2 Jumbo HTA Hobby Box Factory Sealed. 1 Auto, 2 Relic.